It wasn’t long ago that the conversation centered on Sabres training camp involved more questions about which players could take an unexpected leap to in order to fill a much-needed spot in the lineup. Thanks to a flurry of summer trades and a bit of lottery luck, the Sabres roster features more locked positions than gaping holes. The acquisitions of Conor Sheary and Jeff Skinner filled out a thin left side while Patrik Berglund and Vladimir Sobotka may not be offensive dynamos, offer much-needed stability deeper down the lineup. Buffalo top-six is all but settled at this point. Jack Eichel, Casey Mittelstadt Sam Reinhart, Sheary and Skinner are written in pen. Kyle Okposo might as well be too, though I suppose there’s room for him to bump to the third line if Phil Housely feels they can ice a third scoring line. Where the real battles will occur are in the bottom six, where there are probably three spots truly up for grabs. Berglund is going to be Buffalo’s “third” center. He’ll likely be tasked with handling more difficult matchups, defensive zone draws and some (keyword: some) of the other duties that were previously filled by Ryan O’Reilly. Berglund won’t come close to covering all of those responsibilities, but he’s the one center in Buffalo’s camp best suited to take on a chunk of them. He’s another player whose spot was never going to be in question, though one factor that could be at play is whether or not Housley wants to inject more offense into the lineup. Should that be the case, and the Sabres attempt to ice and third “scoring” line, would Berglund be in pole position to center that unit or would the organization still view him as their shutdown pivot and search for another player to center a third scoring line? With Tage Thompson and Alex Nylander as the two most offensively gifted prospects most likely to challenge for an NHL job, the Sabres might prefer to use Berglund as the responsible veteran to balance out a more offensive minded youngster (or youngsters). There was talk over the summer of Sam Reinhart being used as a center again but I think that experiment should be concluded by now. He’s played his best hockey on the wing, there’s no reason to keep toying with something that just hasn’t yielded the results they were hoping for. I’d sooner see them give Tage Thompson run as a third offensive center than pull Reinhart away from a position he seems most comfortable at. Thompson is one of a handful of forwards who are truly in a battle for a roster spot. He, Zemgus Girgensons, Johan Larsson, Nylander, Rodrigues, Sobotka and Scott Wilson are all in the mix for the final spots along Buffalo’s bottom six. Justin Bailey and Nick Baptiste are in that conversation as well and you can’t rule out Rasmus Asplund, Sean Malone, Andrew Ogleive or CJ Smith either. The biggest debates regarding this group will revolve around waiver eligibility, deployment and usage at the NHL or AHL level and just what type of roster the Sabres are going for. I mention the idea of attempting to create a third scoring line, something that’s fairly commonplace among the league’s elite, as something the Sabres may want to push towards. Buffalo’s pipeline is filling out once again, the group of offensively gifted players inching closer to an NHL roster spot seems to be growing by the day. I’m not sure Buffalo has the horses to fill out a group like that just yet. They have some pieces just on the periphery but they may not be ready for a jump that big. Another factor here, as noted above, is the assumption that Berglund will wind up being used to take some of the previous zone starts and matchups that went to Ryan O’Reilly. It would be tougher to put that responsibility on him if he has one or two youngsters riding shotgun with him. Further to that point, if Berglund is expected to take tougher matchups in order to give Eichel and Mittelstadt’s units more freedom, how much time will be left for Buffalo’s fourth line? Would it make sense to ice a third offensive line separate from Berglund’s unit if they’re going to get table scraps when it comes to minutes? Would it be more beneficial to the likes of Thompson, Nylander and Smith to get prime deployment in Rochester until there is a better opportunity for success in Buffalo? Lastly, waiver eligibility will come into play in deciding who makes the squad. At some point it’s going to be time inject young, high-end skill into the lineup. But there aren’t too many NHL clubs that will willingly waive upwards of four veterans in favor of a handful of rookies. It’s just not a wise move from an asset management perspective. So, while it would be terrific to see Rasmus Asplund centering Thompson and Nylander, I don’t think Housley or Jason Botterill would do that at the expense of waiving Larsson, Girgensons and Scott Wilson. No matter how badly you may want them to do so. Given that Asplund, Nylander, Ogleivie, Danny O’Regan (who I keep forgetting when discussing this group), Thompson and Smith are waivers exempt, the organization has far more flexibility in protecting their players. I do expect at least one of those players to steal a spot from a veteran in camp. Larsson will be the betting favorite to be the odd man out and considering the center flexibility the Sabres have with Rodrigues, Girgensons and now Sobotka, seeing Larsson wind up on waivers is a distinct possibility. That puts the battleground for the few open roster spots along the wings on the third and fourth lines. Jason Pominville isn’t going anywhere. Berglund is a lock and Sobotka’s ability in the faceoff dot makes him a strong pick for Buffalo’s fourth center. That leaves three spots; one on the right side and two on the left. Rodrigues probably has the inside track on one of those spots while Girgensons and Wilson will be in tough to fend off charges from the youngsters. I could see Alex Nylander on Berglund’s left side, opposite Rodrigues. But I think the organization would prefer him to start in Rochester and put up some big numbers before making the jump. Not unlike the forward group, Buffalo’s blueline is pretty well set at the top while there’s a sizeable group of players vying for playing time on the bottom pair. Waiver status will probably force the Sabres to keep eight defensemen while also serving to shape how the battle for those bottom two (four really) spots shakes out. Brendan Guhle is the likely waiver casualty here as his exempt status would allow the Sabres to send him to Rochester without exposing any of their veterans to the waiver wire. As with the young forwards, Guhle would be put in a position to play major minutes for the Amerks while offering the added benefit of protecting the vets who are waivers eligible. That probably spares Nathan Beaulieu and, to a lesser extent, Matt Hunwick. Beaulieu occupies a very similar space as Johan Larsson with most of the fan base and I’d venture a guess that a vast majority of fans would be pleased if he was exposed to waivers with the intent of sending him to Rochester. I suspect the most likely scenario is that Beaulieu and Hunwick will be Buffalo’s seventh and eighth defensemen to start the year. That keeps Buffalo’s stable of blueliners well stocked while keeping Guhle from falling victims to a numbers game where he’s seeing limited minutes or even watching from the press box on occasion. I’m painting with broad strokes here as there’s a good chance Guhle plays well enough to where the organization can’t send him down. Given how well he played in his cameo last year there’s no reason to think he won’t force Housley and Botterill into a difficult decision. But going with a more measured approach, my assumption is that management wants Guhle to start as Rochester’s number one defenseman and take the first recall should injuries or poor play force a move. Housley will probably have his bottom four in a blender for most of training camp and the preseason. Marco Scandella and Rasmus Ristolainen are locked in as a pair and Rasmus Dahlin is starting with Jake McCabe. Although I suspect you’ll see Dahlin get some run with Zach Bogosian as well. Beyond the top three of Dahlin, Ristolainen and Scandella, there is plenty of room for jumbling. Casey Nelson should be a good fit for the right side of the third pair with Jake McCabe, should the latter not stick with Dahlin. Bogosian and Beaulieu were terrific throughout the preseason in 2017 and it seems like Housley will give them a chance to recapture some of that magic. Although that would exile Nelson to the press box given the early going of camp. Hunwick was going to be the odd man out even if he came to camp healthy. His upper body injury just puts him further behind the eight ball. I still think he sticks with the big club though, even though he’s probably locked in as the number eight. He’s probably the one player at camp the organization would place on waivers without any worry of the consequences, but from a strict numbers perspective I could see Botterill and Housley opting to keep him on the roster for injury insurance. Fan sentiment would see Beaulieu and Hunwick banished to Rochester, maybe even Cincinnati, with Bogosian seeding time to Guhle, Nelson or McCabe. But this regime has made it clear that they aren’t in the business of rushing their prospects. Guhle is the only player in a position to force Houlsey’s hand but he’s also the only player who offers the safety valve of waivers. I’m expecting the defense pairs to be chalk. I doubt there will be any big surprises simply because the players not named Dahlin who offer long-term promise still need time to grow. Guhle is all but ready for NHL minutes but Lawrence and Will Borgen are entering their first North American pro seasons. 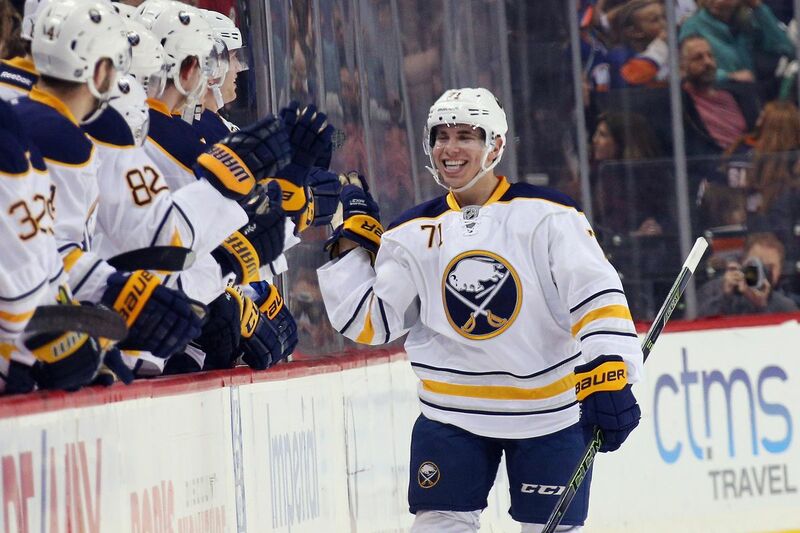 Given the proper time to develop that trio could drastically improve Buffalo’s top-six. Like cultivating the talent for a third scoring line, the team just needs a little more time. There are probably three or four jobs on the Sabres roster that are truly up for grabs. Zemgus Girgensons and Johan Larsson are going to have to play their bags off to keep their jobs. After another great summer I think the organization will be looking for reasons not keep Rasmus Asplund. He’s going to be given every opportunity to make the team and given his work ethic, I won’t be surprised if he does. Asplund and Nylander are going to be popular choices as “darkhorse” contenders to make the roster. In the spirit of being different and offering a different take on things, I have three names to watch for this preseason. These guys probably aren’t serious contenders to make the roster, but they’re players who the organization has a lot of interest in seeing succeed. Tyler and I spoke about Malone on this week’s podcast and Kris Baker of The Athletic mentioned Malone as a guy he’s going to keep any eye on at camp. While I think Malone is probably too far down the depth chart to steal a job on opening night, it’s no secret that the organization – namely Jason Botterill – loves his game. I bet he’s going to get plenty of looks in preseason games to show what he has to offer against NHL competition. He’ll be at the front of the line when it comes to recalls this year. Botterill went out and acquired Hickey this summer and every time I’ve watched him I’ve come away impressed with his overall mobility. He won’t get a ton of fanfare due to the more familiar names above him on the depth chart (Guhle, Borgen, Pilut) but I’m hoping he shows the foundation for an NHL future through camp and the preseason. Aside from the usual talking points about adjusting to the North American ice surface and NHL game, I am very interested to see how Pilut acquits himself compared to other defensemen in the organization. He’s in a great position to play important minutes and get plenty of special teams deployment for the Amerks this year. Will the preseason open the door to a quicker path to NHL time or will we see that a development year in Rochester is just what the doctor ordered?